Y post assembled airport security fence for protection. Features: Corrosion resistance, nice appearance, easy maintenance, anti-intruding. Uses: Mainly used for barrier and security around the airport and anti-climbing projects. Airport Fence, is mainly used in the airport for protection. The main panel and V panel is welded with 4.0mm/5.0mm low carbon steel wire. 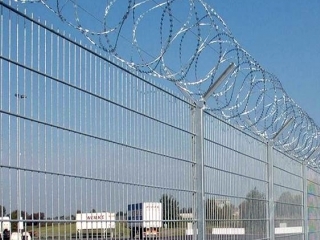 The surface treatment of airport fence is galvanized + electrostatic polyester powder coated or galvanized + PVC coated. 600mm V shaped square pipe is used to connect the mesh panels at each 2.5m interval. Airport fence with concertina razor wire on top will be more secure. Mesh hole: 25*75mm—150*300mm; generally 50*100/75*150/60*120/50*150mm. Application: The airport, residential quarters, factories and mines, temporary construction sites,ports, gardens, farms, military bases, prisons and other areas. Low carbon steel diamond mesh has a heavy galvanized coating to ensure a long life. Use for High security building: Airport ,Farm land,Sport field,Prison and so on. It can offset force,so it is widly use for sports field. Chain link wire mesh is separable,you can adjust the length as you need. The height can be up to 7m. It is more security to add some razor barbed wire or barbed wire on the top.